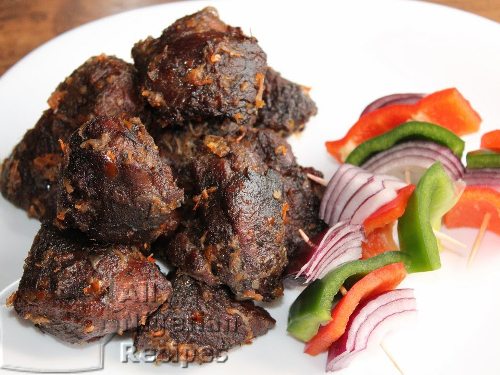 Asun is a Yoruba delicacy that you will always see in the Small Chops section at every owa mbe. It is simply grilled/barbecued goat meat with lots of pepper. I usually prepare this the way I prepare my Nigerian Peppered Gizzards. Cut the goat meat into big chunks. Make sure you cut the chunks with the goat skin. If the skin is not there, it won't be the real deal Asun. Wash and put the goat meat chunks in a bowl. Add the thyme and black pepper; crush and add the stock cubes. Feel free to add other spices and ingredients that you use to marinate meat. Mix the spices and the goat meat by gently rubbing with your hands. Cover the bowl with a thin film. Put in the fridge and leave to marinate for about 1 hour. In my opinion, marinating beef and other kinds of meat is completely optional so you can skip the marinating process and go straight to cooking the goat meat. 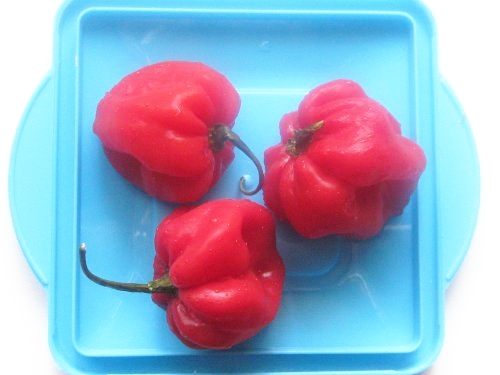 Pound or blitz the habanero (scotch bonnet) peppers and set aside. After about 1 hour or the number of hours you chose to marinate the goat meat, put the meat in a pot. Use a pressure cooker if you have one because goat meat is quite tough and you will save lots of gas and electricity. Pour water to just half of the level of the goat meat, add the big chunks of onion and start cooking at medium heat. You do not want a lot of water because you want the water to dry up by the time the goat meat is well done. When the goat meat is well done, remove the big chunks of onions and add salt to taste. Increase the heat to high and stir constantly till all the remaining liquid in the pot is absorbed. You don't want to lose any flavour by pouring away the goat meat stock. Lay the goat meat flat on your oven rack. Grill/Broil in the oven at 180°C or 350°F till the meat is brown all over. You will need to turn them from time to time. The meat should not be dry. This takes a maximum of 15 minutes with my oven. While you are grilling the meat, wash, cut and thread the green bell pepper, red bell pepper and the remaining onion on toothpicks. When the meat it well grilled/broiled, heat the vegetable oil in a dry clean pot. Add the pepper and the thick stock from cooking the meat (if any) and fry for a bit. Add the grilled goat meat. Stir very well till the pepper is evenly distributed on the goat meat. The vegetable oil ensures that this happens and gives the Asun a nice glow. That's it! Serve with the threaded vegetables. If you are entertaining guests or having dinner with the family, serve with Fried Plantains or Jollof Rice. If you are hosting a party, place them in a flat tray and put out with other small chops and snacks for your guests to enjoy.